When showing fillets and radiused corners, I'd like to display dimensions that reflect the radius of the indicated geometry. When I add a reference dimension to the arc generated by the "Sketch / Tangent Arc at Point" command, it shows the diameter, prefixed with the diameter symbol. While this is technically correct, it would be easy to misconstrue when sent to the shop for fabrication. How can I show radii (prefixed with "R") instead of diameters in dimensions? Dale, I think it could be implemented fairly easily. How would you like choose between diam and radius?. As I see it, one of the brilliant things about Jonathans program, is the minimalistic interface with simple intuitive options and commands. From and engineering point of view I think radius is more versatile than diameters, which doesn't make sense for arcs. Therefore I would be inclined to change it globally. P.S. do you have a shop that accepts solvespace files? Ideally the option would be associated with individual distance/diameter/length constraints; not with the entity itself, and certainly not in a global sense. We already have that - all dimensions on round things are displayed as diameters, globally. I, too, applaud the minimalistic interface. It's definitely one of the most attractive aspects of this software! However, a system should be as simple as possible, but no simpler. Being able to distinguish between showing a dimension as a diameter or a radius is important when you're trying to clearly document aspects of a mechanical or simply physical design. Sometimes you want one and sometimes you want the other. So this seemingly simple request could involve changing the internal representation of the constraint data (adding a radius/dimension toggle), how it is stored in a file, as well as implementing the user interface to gain control over its state. I don't know that any other constraints are editable at this time, so it might take some head-scratching to figure out the best way to do this: in a "simple, intuitive" manner. I've looked at the code to see how I might "hack" something that would give me what I want. I thought it might be a simple add-on and a good "1st step" into learning how to bend SolveSpace to my will. However, it looks a bit more complex than I originally thought. Even the diameter symbol that prefixes all diameter dimensions is "drawn" in software and not printed as text. Two spaces are appended to the dimension to leave room for the drawing. I would have to change that to an "R" to indicate radius. So not a trivial thing, for me, today. No, I don't have a shop that accepts SolveSpace files... yet. I export the design to a DXF and print that. Right now, I have to add comment constraints to be able to indicate radii. These won't auto-magically change when I adjust the actual radius and forget to update the comments. Hi Dale, the ideal solution would be to have a general implementation of formulas which would solve many problems. In that way one could just divide by 2 and get the radius. It sounds like you're really making lots of serious stuff with Solvespace. How do you get around follow me/sweeps for screws and stuff (see Implementation of follow me/sweep thread)? Yes, that would be useful in a general sense. What I was wanting was something a bit more specific. It seems, however, that the cascade effect causes one simple change to ripple through the entire project in one way or another. Just adding a single attribute to a single entity (radius or diameter in an angular dimension) affects the user interface, the internal data representation and the file format. Yikes! There are some things that I think will always be just out of reach with the software as it currently sits. I don't know what the development road map looks like, but without some sort of scripting we will never have features like import or even printing directly from the application. Maybe that's where I should start working. See attached file for reference. Yes, that will work. Thank you for the suggestion. I'll be taking another look at the code this morning. Perhaps if I approach the challenge with a plan in place it will not seem so daunting. 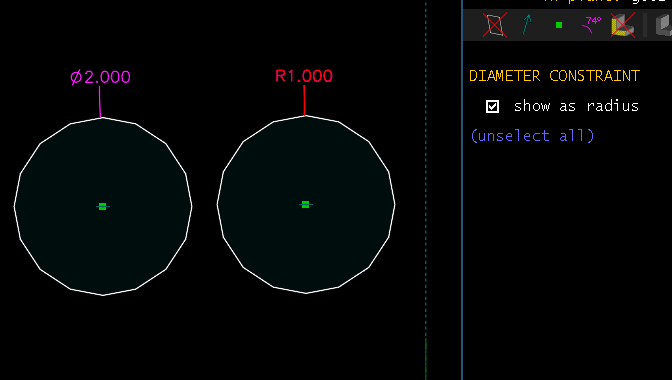 I've spent a little more time thinking about how to display radii instead of (or in addition to) diameters. We don't need to change the geometry at all. The only thing that needs to be added is a new "radius constraint" that is effectively a duplicate of the "diameter constraint", with the notable difference being it thinks in terms of radii instead of diameters. Diameter only mskes sense for circles. Radii applies more general to circles and arcs, maybe we should learn to use only radius and to multiply by two. Anyway what I would like to see was the possibility to annotate with text and formula rendering so one could write �=2*rb, and get/see �=42 with the variable rb = 21 set somewhere.